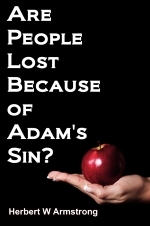 "WHY IS IT," some people will ask, "that this WHOLE WORLD has to suffer so much now, because of ADAMS SIN?" There's a common belief that as a result of the original so-called "FALL of MAN" — meaning the transgression of ADAM — that all people are BORN LOST — consigned straight to an ever-burning torment of HELL FIRE! Let's LOOK AT this ancient event that is called the "FALL OF MAN!" We take a lot of things for granted — we unquestioningly accept and assume a lot of things we hear or read — or that have been generally accepted and believed. And when we take out some of these things and take a good LOOK at them, we receive some shocking surprises! The common idea in the CHRISTIAN-PROFESSING world is that God originally created Adam, the FIRST MAN, an Immortal, PERFECT, spiritual character. The Bible expression: "God created man In His own image" has been interpreted to mean that God made man immortal and spiritually PERFECT — and created of the SAME COMPOSITION AS God — that is, out of SPIRIT. The BODY is interpreted to be merely the material GARMENT the spiritual man wears — or the physical HOUSE which an immortal soul inhabits. And thus, it is commonly believed, God has COMPLETED HIS CREATION. The man was perfected, completed, immortal, PERFECT in character! And then, this theory continues, along came Satan. The Devil succeeded in WRECKING this perfect creation — this man that God had perfected, causing him deliberately to SIN! And this SIN of Adam is supposed to have somehow affected a CHANGE in the man's NATURE. He was now a FALLEN man — he now had a DIFFERENT and a FALLEN NATURE than he had had previously. He and all his descendents were now automatically consigned, upon the experience that we call DEATH, to be plunged into the eternal torment of HELL FIRE. Here had stood, in the man ADAM, the SUPREME MASTERPIECE of all God's creation. But Satan succeeded in WRECKING what God had created — THWARTING God's purpose — UPSETTING God's Plan! It is looked upon something like an automobile manufacturer who had manufactured one very far-advanced, perfectly precisioned automobile — His SUPREME MASTERPIECE — only to find that, on its first drive out of the factory, an enemy had come along and WRECKED that car. The idea is that the manufacturer would have it towed back in, and would set out to REPAIR THE DAMAGE. The general false conception is that ever since the so-called FALL OF ADAM, God has been doing His very BEST to get the WHOLE world SAVED — that is, to restore men to a condition AS GOOD AS Adam was before the so-called FALL. And, further, that there is a great COMPETITION going on between God and Satan. Saran is very cunningly RESISTING God, RESTRAINING and OUT-SMARTING HIM so that only a small fraction of the WHOLE world's population is actually being saved. Now this entire erroneous teaching pictures Satan as more powerful than God — he's getting the best of the competition. It represents Satan as being able to thwart God's purpose, to step in to upset God's plan and then to use his cunning and his deception and his wiles to out-wit God and to prevent God from repairing the damage in the case of more than a very small fraction of the human race. In Genesis 1:27, it certainly DOES say that God CREATED man IN HIS OWN IMAGE. But it does not say that man's COMPOSITION was the same as God's — that God made man of IMMORTAL SPIRIT! Notice what it says about what God made man OUT OF — Genesis 2:7: "And the ETERNAL God formed man" — not the HOUSE that man was to enter, not the GARMENT or CLOAK he would wear, but "formed MAN of the dust of the ground, and breathed into his nostrils the breath of life; and man BECAME a living soul." The word "soul" as it was originally inspired and written by Moses in the Hebrew language was NEPHESH" and "nephesh" means the life of animals — of animals who receive their life from the BREATH OF AIR. It is the very antithesis of ANYTHING immortal. It means material life sustained by blood and the breathing of air — that's what the very word "nephesh" translated here "soul" means. A number of times in the first chapter of Genesis the various animals were called "nephesh" in the original inspired Hebrew — only the translators in our English version of the Bible translated it "creature" there, and "soul" when it came to man. The word "breath" — the "breath of life" here — simply means "air" or "wind." Isn't this exactly what every man breathes in and out of his nostrils? Why certainly! It was this same "BREATH OF LIFE" that God caused to be breathed in and out of the nostrils of animals. Notice the time of the flood in Genesis 7:21-22. It is recorded that "ALL flesh died that moved upon the earth, both of fowl, and of cattle, and of beast, and of EVERY creeping thing that creepeth upon the earth, AND EVERY MAN: ALL in whose nostrils was the BREATH OF LIFE. That includes all of the animals, as well as man, in whose nostrils was the breath of life — "of all that was in the dry land, died." There we see the same identical Hebrew word used that is used for MAN — and God breathed into MAN'S NOSTRILS the BREATH OF LIFE — the same Hebrew word precisely, that is used for breathing in and out of the nostrils of animals. We read in I Corinthians 15:53, this MORTAL must PUT ON immortality." The Bible says that man is DUST — that man is MORTAL, but that man can RECEIVE immortality and that he must PUT ON immortality at the resurrection of the just. Now turn to Ezekiel 18:4, "...the soul that sinneth, it SHALL DIE." It isn't immortal! And that's repeated again in the Bible — it's given twice. Sinful man shall not LIVE forever, but DIE! Beginning with verse 15 of Genesis 2: "And the Eternal God TOOK the man, and put him into the garden of Eden, to dress it and to keep it. And the Eternal God COMMANDED the man, saying, Of every tree of the garden thou mayest freely eat: But of the tree of the knowledge of good and evil, thous SHALT NOT eat of it: for in the day that thou eatest thereof thou shalt surely DIE!" — (Gen. 2:15-17). How could that be IF Adam were ALREADY immortal? IF the man were PERFECT in character — if HERE were PERFECTION, the MASTERPIECE OF all God's creation, and God had completed the creation and was THROUGH with it — would He have said, "In the day that thou eatest thereof thou shalt surely DIE?" It wouldn't have been POSSIBLE if the man were perfect — the man couldn't have fallen if he had been perfect, could he? He said, "In the day that thou eatest thereof thou SHALT SURELY DIE!" — not LIVE forever. He didn't say, "You'll live forever in some other place or condition — in hell." No, the penalty for sin is DEATH! Satan came along to deceive this human, mortal man, that had been made from the dust of the ground. First, Satan called God a liar when God said that the man was mortal, subject to death if he committed sin. God said, "In the day thou eatest thereof thou shalt surely die" — in other words, the man is mortal — subject to death. But, you read in Genesis 3:4, that the serpent said, "Ye shall not surely die." He questioned the veracity of God's Word! Satan argued that the man was ALREADY immortal — an immortal soul that would not die — that he would live forever anyway. But God had said, just as you read in Romans 6:23, that the "wages of sin is DEATH and the GIFT of God is Eternal Life." Satan argued that if we disobeyed God — if we commit sin — that we will be as God — like God. We'll be like gods ourselves — that is, immortal spirit. And so, somehow, ever since, most people have just assumed and gotten into their minds the idea that when Adam was created "in the IMAGE of God" he was created and made of the same COMPOSITION as God — that is, composed of immortal spirit and of PERFECT character, and that he was created in the same character and the same nature of God originally, but that his nature changed and he fell. In John 4:24 in the New Testament, you read that "God is a Spirit." But nowhere does the Bible say that MAN IS a SPIRIT, or that man is SPIRIT. Rather, the Bible says that man is dust — "unto dust shalt thou return," saith God. In I Corinthians 15 of the New Testament, it says that "man is OF the earth, earthy." How was Adam made in the IMAGE of God? How could he have been in the image of God if he was of different composition? Just the other day I saw a statue or image of Abraham Lincoln. Now if I would tell you that that statue was composed of flesh and blood, you would tell me I was crazy, I'm quite sure. No, it was composed of iron. I have seen images composed of wood, bronze or stone. Abraham Lincoln was made of flesh and blood, but the statue, made in his image, was made of iron. Almighty God is made of SPIRIT, but the man who was made IN HIS IMAGE was made of the dust of the ground — he was made flesh and blood. God Almighty is NOT flesh and blood, God Almighty is SPIRIT. Jesus Christ said, "That which is born of the flesh IS flesh" — plain flesh and blood of the dust of the ground — "that which is born of the Spirit," He said, "IS SPIRIT." He said also that man can be born of the Spirit he SHALL BECOME Spirit and then he will be Spirit, but he is not Spirit now. Jesus was explaining to Nicodemus, in John the 3rd chapter, how man is mortal — man is flesh — but that he may be born again, and he MUST be born of God before he can become immortal. Eternal Life is the GIFT of God. "And as we HAVE borne the image of the earthy we SHALL also bear the image of the heavenly." Here it's talking about COMPOSITION — here it's talking about one man being made of the DUST of the ground, another being of SPIRIT. And, we have only borne the image of the dust of the ground, but we SHALL bear the image of the heavenly. We are only in the form and shape of God now, but NOT of the radiant composition, NOT of the same character. We're merely the clay model and God Almighty is the Master Potter. He made us of matter so that He, the Master Potter, could reform and shape us into the final image that it was His purpose originally to make us. There wasn't any competition between God and Satan. The "fall" of man wasn't what you have been supposing. God put the very nature in man that CAUSED the man to fall. God KNEW that redemption would be necessary and it was planned long before that very first man had been created. God has a GREAT purpose, and the world has lost sight of that purpose. It couldn't have been brought about in ANY OTHER WAY than the way that God is doing. Satan was NEVER more powerful than God — he never frustrated God's purpose, and he never will. What is wickedness or sin? The Bible definition is, "Sin is the TRANSGRESSION of the Law" (I John 3:4). That's the LAW of God, and it's a law that God created — it's a law God set in motion — it's a LIVING Law — it's an inexorable Law — it's the Law of LOVE. It's a WAY of life. It's the Way of PERFECT character. It's the WAY of SPIRITUAL character. LOVE is the fulfilling of that Law but it takes the SPIRITUAL LOVE of God shed abroad in our hearts by the Holy Spirit to fulfill that Law, and to establish that character in us. There are five senses, the sense of seeing, of hearing, tasting, smelling and feeling. When God created Adam, he put IN Adam the same five senses that are in you! And mark this now, the SAME SENSUAL NATURE that CAUSES you to sin! Adam sinned, didn't he? Let's examine that sin and see what CAUSED him to sin — or, let's take Eve, because the account of her sin is described in detail rather than Adam's. After the devil had tempted the woman, "when the woman saw that the tree was GOOD for food, and that it was PLEASANT to the eyes" — here are her five senses at work — "and a tree desired to make one wise" — there is vanity — "she took of the fruit thereof, and did eat" — that was stealing — "and she gave also unto her husband with her, and he did eat" (Genesis 3:6). There is the first sin. The woman could see, she had the sense of sight — she saw that the forbidden tree was pleasant to the eyes. Now, she had the sense of taste. She realized that the tree tasted GOOD — but God had forbad it. God said it is NOT good for her, it may look good, it might even taste good, but it is poison in her stomach, and there's a bad principle involved — but the woman saw otherwise. She thought otherwise in her carnal mind — her appetite was aroused — she craved the taste of it. Then, vanity was aroused in her — it was, so she believed, desired to make her wise. And all of these lusts which break the tenth commandment caused her to break the commandment against stealing, and to take the fruit that did not belong to her and that had been forbidden to her and her husband. In so doing, she obeyed Satan — she had ANOTHER god BEFORE the true God, and she dishonored her ONLY parent, so she broke the first and the fifth commandments. Yes, sin is the transgression of the Law — and God's Law was BROKEN in FOUR distinctive places in that first original sin in the garden of Eden. Four of the TEN COMMANDMENTS. Adam and Eve were ORIGINALLY created with the SAME nature, the SAME five senses, with the SAME pride and vanity, the SAME desires, appetites, nature and vanity that you and I have today. Now when the first man and woman yielded to those appetites and desires — to the very nature which God had originally CREATED IN them — and transgressed God's Law, committing the FIRST sin, then what happened? Did their nature change? Did they then fall from immortality and become MORTAL all of a sudden? That is ridiculous! Notice, there wasn't any change in their nature — there wasn't any fall in their nature — it was the very nature that had been originally created in them, and their willing YIELDING to it was what caused the sin. What happened was that their eyes were opened as a result of it — now the KNOWLEDGE of evil had come. "They KNEW," it says. Yes, KNOWLEDGE came — they KNEW! I always wondered what was meant by the KNOWLEDGE of good and evil before I was converted. Then I found out. To have the knowledge of evil is to know evil — to participate in it — and that means to rebel against God and to break His Commandments. They came to the wrong knowledge. Man's knowledge is mostly a mixture of good and evil. Human nature is a MIXTURE of good and evil. There's good in all people, and there's also evil in every one of us that we need to recognize. Animals do not sin. Animals don't know enough — they don't have the KNOWLEDGE to commit sin. Animals live and go and proceed by instinct — they do exactly as God intended. But MAN came into the KNOWLEDGE of evil. Man has a mind. Man must make his OWN decisions, and MAN is the only flesh creature that knows how to commit sin. Genesis 3:16-17: "Unto the woman he said, I will greatly multiply thy sorrow, and thy conception...and unto Adam he said, Because thou hast hearkened unto the voice of thy wife, and hast eaten of the tree of which I commanded thee, saying, Thou shalt not eat of it: cursed is the GROUND for thy sake; in sorrow shalt thou eat of it all the days of thy life" — there was a curse on the GROUND, but not any change in the nature of the man. Notice, "And the Eternal God said, Behold, the man is become as one of us" — like God — "to know good and evil: and now, lest he put forth his hand, and take also of the tree of LIFE, and eat and LIVE for ever" — lest he gain Eternal Life, an immortal life which was offered as God's gift in the garden of Eden — "therefore the Eternal God sent him forth FROM the garden of Eden to TILL the ground from whence he was taken. So He drove out the man: and He placed at the east of the garden of Eden, cherubims, and a flaming sword which turned EVERY way, to KEEP the way of the tree of life" — lest he go back and BECOME immortal. No, the man was not immortal. He had the opportunity of becoming immortal but he spurned it — he turned it down. Notice I Corinthians 15:22: "For as IN Adam ALL die, even so IN Christ shall ALL be made alive" — the same "ALL" that die in Adam. Why? Simply because Adam was originally MADE mortal — made of the dust, composed of flesh and blood — of matter, not of spirit. Does this say that because Adam fell all die? No, most certainly not. But, as in Adam all die — that's speaking of this first death, so after that, the resurrection. The wages of sin is not just this first death that people die, the wages of sin is an ETERNAL DEATH. "In Adam all die, even so in Christ shall all be made alive" — that's the good, bad, and indifferent — all people — sinners and saved alike. That is not the ultimate penalty of sin! The final penalty of sin is the SECOND DEATH, from which there will NEVER be a resurrection — it is ETERNAL PUNISHMENT. DEATH is that punishment, forever — eternally. We were born from our parents, and so on back to Adam who was created MORTAL — formed of the dust — composed of FLESH and BLOOD. IN Adam — as long as we are his children — born of him — we all die this FIRST death. But IN Christ, ALL who are not in the first resurrection will be made alive by another resurrection to mortal life (Rev. 20:5, 12 and I Cor. 15:40). Notice Romans 5:12 — "Wherefore, as by ONE MAN sin entered into the world, and death BY sin; and so death passed upon ALL men, for that ALL have sinned" — the real death penalty — the second death — passes on you, because YOU have sinned — because ALL have sinned, and NOT BECAUSE of Adam's sin. Notice, sin entered this world by ONE man — sin is the transgression of God's Spiritual Law. Adam was a mortal-flesh and blood — human. He had the NATURE of sin in him, otherwise, he WOULD NOT have sinned. If he had been perfect, he would NOT have sinned. He had the sensual nature — the sense of sight, of hearing, tasting, smelling, and feeling, and GOD had put that nature in him — God talked to him — preached a sermon to him — TOLD him that the wages of sin would be DEATH. But if he resisted that nature, if he partook, instead, of the TREE OF LIFE symbolizing the HOLY SPIRIT of God, fulfilled God's Law, THEN he could have had the GIFT of Eternal Life. But Adam rejected that. Adam sinned. He never RECEIVED the precious gift of Eternal Life. He was driven out of the garden of Eden lest he RECEIVED it, and so DEATH passed upon ALL men. Here's where the death penalty came — NOT because of Adam's sin — that's what most people have thought, but look at it in YOUR BIBLE — death is passed up ALL MEN BECAUSE that ALL HAVE SINNED — because WE have sinned, not merely because of Adam's sin. No, it says in PLAIN language that DEATH has passed upon ALL men BECAUSE that ALL HAVE SINNED. The DEATH penalty is passed upon YOU — it is passed upon EVERYONE of us, BECAUSE WE have sinned — because WE have lived the wrong way and have not turned to God. The Scripture does NOT say that the penalty of Adam's sin is ETERNAL death for you and for me — but the PENALTY for YOUR sin, of MY sin, of OUR sins, is DEATH! But God so loved this world that he GAVE his only begotten son, Jesus Christ, that whosoever believeth on HIM should NOT perish, but should have the GIFT of Everlasting LIFE (John 3:16). The way is TO REPENT — to REPENT OF SIN — and ACKNOWLEDGE Jesus Christ as PERSONAL SAVIOUR. Then the promise is, we SHALL receive the GIFT of the Holy Spirit. And then, if we grow in grace and in knowledge — IF WE OVERCOME, overcome the world, overcome ourselves and our own natures, if we endure until the end — then we shall be made immortal — we shall be BORN into the very FAMILY OF GOD at last.